We have added an incredible new tool to PricePoint which allows clients to easily compare tariff price levels between multiple agents. Having manually performed such analysis in the past using tedious spreadsheets, I can personally attest this reduces many hours of work into a matter of seconds. Agents can restrict any clients from accessing their rates/identity, including on the analysis tool. Clients are restricted by default from other agents' pricing in the same country. Only clients can access the analysis tool. All clients have signed a strict non-disclosure agreement prohibiting them from sharing any agent pricing with any other agent. The following explanation is paired with the below screenshot. The Client user is able to select any Market location within PricePoint (e.g. Singapore, London, Chicago, et al.). 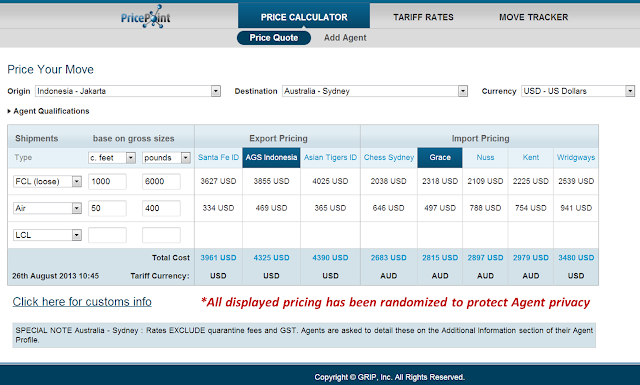 Upon doing so, PricePoint's algorithm performs thousands of calculations within a few seconds and produces a chart (upper section) of all available agents' tariff price rankings, per shipment type. The ranks (1 is lowest cost) are a composite based on a broad array of shipment sizes per type. In the lower section, the user is able to specify any of the available agents for a detailed breakdown of price differentials compared to 1) Market Leader, and 2) Market Average. Example: the selected agent's Destination FCL Loose pricing is 1.78% higher than the market leader, and 15.96% below the market average. With this information, the client can determine if their preferred agents are offering market-competitive pricing. If not, the client can request an exclusive tariff discount from the agent, which the agent can easily apply on their Privacy/Discount settings page. All data displayed on the analysis tool is specific to the client user, including exclusive discounts from agents. Over the years I've occasionally encountered Agents who have been resistant to honoring tariff "breakpoints", but I'm not sure how widespread the resistance is. 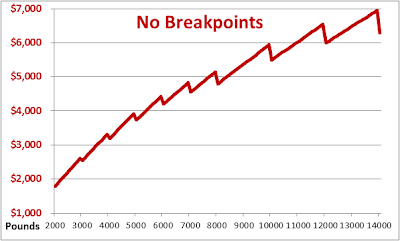 I'm going to explain the reasoning on why we believe breakpoints should always be honored, and why we therefore apply breakpoints in PricePoint. In the above scenario, the higher weight / lower cost breakpoint should be applied. Why? Most importantly, it's simply the practical thing to do. All things being equal, what justification is there that a smaller shipment should cost more money than a larger shipment? 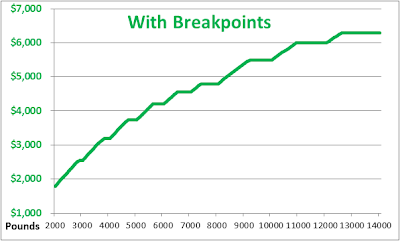 On a more academic level, breakpoints simply provide a more rational price curve, which is beneficial to sales efforts in terms of not senselessly overpricing a competitive quote. Now see the following price charts of that tariff, based on breakpoints being applied vs. not applied. 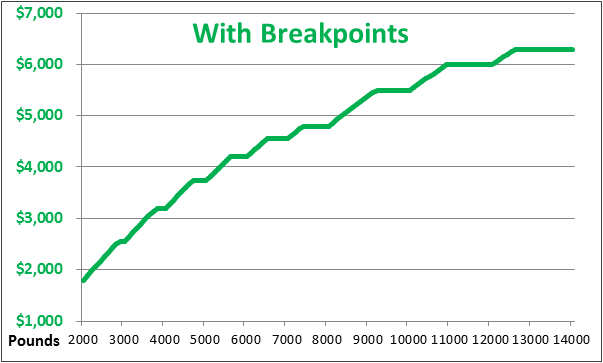 Breakpoint application provides a smooth upward trending price curve, which is rational to increasing shipment size. Without breakpoints, prices erratically jump up/down as the shipment size increases. For all of these reasons, PricePoint automatically checks for and applies breakpoints on quotes (preventing costly human error oversight). When applied, the quote detail screen displays the higher "Chargeable" shipment size, directly below the actual "Declared" size. A random study of PricePoint quotes revealed that breakpoints are applicable in roughly 1 out of 3 quotes. A minor upgrade to announce: within the quote details on the OFS for FCL shipment type, the destination THC line now stipulates whether a 20' or 40' container is being assumed. Towards the objective of simple and unconfusing design, we do not require agent tariffs or quotes to specify container size. Instead we apply a quote assumption based on an over/under threshold of 1100 cubic feet. The new THC clarification is simply to help avoid any incorrect assumptions. The top 20 alone totals 93,122 quotes. Let's consider that further and conservatively estimate that the average traditional quote process via email request/reply requires 5 minutes of shared processing time between Booker and Agent (not to mention overnight wait time, potential for human error, etc.). Let's also assume the average PricePoint quote requires 1 minute (although 10-20 seconds is more likely). That means PricePoint has saved over 6200 combined man hours for the top 20 alone. In addition, rather than getting one quote per traditional email, PricePoint provides 5-10 company options per location on average. Just in time for the upcoming IAM convention in Vancouver, we've added a great new feature for Bookers to better manage directing tonnage to their preferred agent network. To explain, consider the typical convention environment in which you have meeting after meeting to explore or continue reciprocal trading agreements. Those management-level good faith discussions have the potential to not be followed-through back at the office, simply due to disconnect at the coordination/ops level who were not in attendance at the convention. Therefore, PricePoint now allows Client Bookers to specify their preferred Agents within our database, which will in turn highlight those agents when the Booker's coordination/pricing staff are assigning moves via PricePoint. 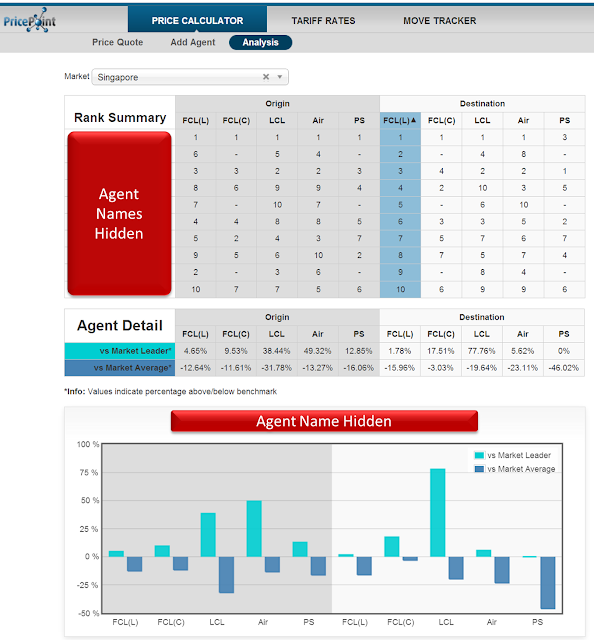 See image below, with example preferred Agents highlighted in dark blue (all displayed pricing on this image has been randomized to protect Agent privacy). This new feature enables you to always keep your staff on the same page of who your company's preferred agents are. Simply email a list of your preferred agents to admin@griprocure.com, or download a current copy of PricePoint's active Agent list (http://tinyurl.com/PP-agentlist) to mark your preferred Agents, again emailing to admin@griprocure.com. Your request will be processed within 24 hours, with confirmation of completion. "A marketplace is a good idea for privacy-enhancing technologies." Contrary to the initial assumption that some people have, the online marketplace of PricePoint actually enhances confidentiality, compared to traditional pricing methods of published tariffs, spreadsheet, and email quotes. A number of my blog posts make reference to PricePoint's privacy structure (see Privacy label for other posts), which is appropriate as privacy is the most essential design consideration which makes PricePoint work so well. This post will be an overview of our core privacy features. Beyond the landing page (www.griprocure.com) PricePoint is entirely ID/password-secured application. Each user ID is governed by strict firewall protocols. i.e. No agent can access any other agent's data, pricing, etc. When an Agent signs-in to PricePoint, the first thing they see is their Privacy/Discount settings page. This shows the Agent all of our Client/Bookers who potentially have access to the Agent's pricing. That access permission is directly controlled by the Agent. The Agent can apply "Restricted" status to any of the Clients, which applies an immediate and complete firewall so that Client will have no access to that Agent's pricing. Alternatively, the Agent can discreetly apply percentage price discounts/increases to any of the Client Bookers. These settings are of course entirely confidential to the Agent. As addressed in another post, traditional tariffs are often price-inflated because the Agent does not want their truly competitive pricing to fall into the hands of a competitor. To safeguard against this (and in turn encourage competitive pricing), PricePoint's firewalls do not allow ANY other companies to view an Agent's tariffs except for the Agent themselves. Not even our Client users can view the tariffs, who instead use our Price Calculator tool for specific shipment size quotes. This protection prevents a Booker's potential rogue employee from taking screenshots of any Agent's tariff and distributing to unauthorized parties. Since Bookers cannot see your Tariffs, nor your Privacy/Discount settings, they will not know if your are applying a percentage increase or discount to them, unless you choose to tell them of a favorable discount. Any increase/discount will be automatically applied to any price quotes for that Booker via PricePoint. Whenever a new Booker joins the PricePoint Client Group, an announcement email is sent out by PricePoint Admin (admin@griprocure.com) to all Agents. The Agents then have at least 10 days to adjust their Privacy/Discount settings BEFORE that new Booker is granted any pricing access. During that 10 day period, PricePoint Admin will apply default Restricted status on behalf of any Agents who are based in the same country as the new Client Booker. This is based on the presumption that the Agent and Booker are competitors in that country. This serves as a precaution in case the Agent did not see or failed to act on the 10 day wait period announcement. Finally, all our Client Bookers must sign our User Agreement before receiving access to authorized Agent pricing. A central highlighted provision in the Agreement is their acknowledgement that all Agent pricing is to be treated as highly confidential and cannot be shared with any other moving companies. In sum, we expect any participating company would agree that this array of security measures provides far better privacy assurances than any traditional methods of tariffs, spreadsheets, emails, etc. "In the future, if you’re using PricePoint, please don’t ask for separate rates or most likely you’ll get higher prices than PricePoint." This comment highlights a departure from traditional pricing methodology which is central to the international moving industry. PricePoint is designed to help evolve the industry towards this mutually beneficial better practice, as demonstrated by the above agent's mentality. The industry is very sensitive about not disclosing pricing to competitors. Since traditional tariffs can easily find their way into the hands of a competitor, the rates are published at somewhat inflated levels. The industry is of course highly cyclical in terms of peak vs off-peak seasons. Meanwhile traditional tariff creation and distribution is rather tedious, and therefore only done once per year, or even less often. Hence it is sensible to set tariff prices at the "high water mark", because an agent would not want to be held to lower published rates in the busy season. It is common for agents to agree to different price levels for different bookers, so again the agent would not want to publicly distribute pricing which is lower than any of those agreements. All that said, PricePoint resolves all of these concerns. A number of features (addressed in other blog posts - see Privacy label) provide much greater price privacy security than any traditional pricing methods (published tariffs, emails, etc.). These security measures includes the ease of discreetly offering different price levels to different Bookers. Regarding fluctuation/distribution, Agents are free to easily update their tariffs whenever they choose, which effectively provides truly instant "distribution" of the new rates to our Client Booker group, without having to deal with tedious email distributions. In sum, having neutralized the traditional reasons for inflated tariff pricing, it is sensible to offer truly competitive pricing upfront via PricePoint. Why? First, PricePoint serves as a no-cost member of staff who flawlessly quotes OA/DA rates on your behalf. If you have to pay a staff member to manually respond to quotes via email, vs PricePoint quoting those rates for you automatically, clearly the latter scenario creates admin savings which can be shared with Bookers/customers. Taking that thought process further, the traditional approach is to offer a high price via tariff, then discount upon request. That tactic is in some respects irrational because you are reducing your price for a more costly sales process. Hence the agent comment above is essentially saying "please don't waste my time with email quotes since I am giving you a better rate via PricePoint." Lastly, there's also a strong correlation that time-sensitive quote opportunities are also more cost-sensitive. Considering global time zones, PricePoint enables the Booker to provide much faster same-day quotes to their sales leads, rather than waiting overnight (or longer) for the agent's time/cost-consuming email quote reply. Again a more efficient process and higher closing ratio helps to justify lower tariff rates for these cost-sensitive sales opportunities. I thought it could be useful to offer a recurring series of usage advice to Agent users of PricePoint. These are not meant to absolute recommendations, but rather considerations of how you can make use of the unique capabilities which PricePoint offers, compared to traditional pricing methods. Since this is the first post on this topic, let's focus on a couple items for first time users: Quote Basis and Rank. An important design feature of PricePoint is that it allows the Agent flexibility to customize their tariff structure, including unit of measure (cubic foot, cubic meter, pounds). Understand this is for YOUR preference. You do not need to worry about the Booker's preference, because they will not see your actual tariffs (in fact no one but you can see your tariffs, as this is a privacy/security measure). Bookers can only access your pricing via specific price quotes which they can enter in their own preferred units of measurement, and PricePoint performs all necessary conversions automatically. After you have submitted tariffs, you will notice a Rank column on your Tariffs Overview page. This is a algorithmic calculation of your tariffs' price competitiveness for that specific location and shipment type, compared to all other agents in PricePoint (1 is lowest price). Important to note this is entirely anonymous, no competing agents will know each others identity or rank. We created the Rank feature because in my past as an Agent, I found it difficult to determine how competitive my tariff pricing actually was. Therefore the Rank feature provides instant constructive feedback. Based on that feedback, you are free to adjust your tariff as many times as you wish. The Rank will instantly update every time you re-save a tariff. As you may know, Agents are only allowed to file rates in PricePoint if they have been explicitly invited/endorsed by one of our Client Bookers. Certainly the value of PricePoint is largely based on its geographic scope and population of participating Agents, so one might think we should maximize scope and population by any means necessary. However there are a number of reasons why we created the invite-only policy early on and continue to apply it. We founded GRIP as an independent “bootstrap startup” (i.e. no outside or industry investors), which requires being careful with use of limited resources and not bite off more than we could chew. Therefore we didn’t naively plan to on-board the whole world into PricePoint at once. Likewise all software is subject to bugs and ongoing improvement, so it’s best to start the user population relatively small and have it grow in pace with enhancements. Meanwhile we allowed our Client users to determine which Agents and countries should be on-boarded, according to their needs and preferences. It was important to us that we do not falsely represent opportunity to Agents. By allowing Clients to control Agent invitations, it means that there is definite booking/tonnage available to an Agent who is asked to submit rates. In other words, we would not want to waste the time of Agent in Zimbabwe (or our time for that matter) until a Client has actual bookings that can be offered to that Agent/location. Therefore PricePoint’s scope of coverage grows organically according to the real needs of our growing Client base. As detailed in other posts, GRIP’s independence and neutrality is critically important. As an industry veteran, I did not want there to be any real nor perceived bias according to my own industry history or relationships. Only Clients can invite Agents into PricePoint, GRIP does not. There is an ongoing industry concern over “rogue movers”, and quality is certainly a gray and complex topic. We have ongoing plans to enhance the quality dimension within PricePoint. Pending those developments, we felt the invitation-only policy would serve as a practical quality control mechanism. If a Client Booker sees pricing is available from an Agent they are not familiar with, they do have at least the basic assurance that the Agent has been implicitly endorsed by at least one other Client user. I don’t trust Facebook …in a sense. To be clear, I’m not saying that Facebook is evil. In fact, I’m on Facebook, I like Facebook, and I often defend it against critics. However, throughout Facebook’s ever-evolving design, I've been more or less uncomfortable with their privacy controls – which are a common public criticism. Facebook co-Founder and CEO Mark Zuckerberg has said of his intentions “I’m trying to make the world a more open place.” I appreciate that, but in my opinion Facebook’s (mis)management of privacy control UI hinders Zuck’s objective. A well-known Seinfeld-ism of “world’s colliding” is good example of the issue. What people are willing to share with one group (e.g. friends), they may not be willing to share with another (e.g. business colleagues). Since I don’t fully trust Facebook’s ever-changing privacy policies and UI to keep my world’s from colliding in ways I don’t want, I personally apply a more simple firewall of rarely connecting to business colleagues on Facebook, instead utilizing LinkedIn for that sphere of networking. This is clearly undesirable for Facebook’s business model as a significant portion of my networking (and value as an advertising audience) goes to a rival platform. Facebook’s privacy control shortcomings (or my perception of it) served as a direct inspiration in PricePoint’s design towards privacy controls. Facebook and PricePoint face a parallel responsibility towards our users, and I dare say we've done a better job of it with PricePoint. This began with founding GRIP as a completely independent company, and within PricePoint allowing all suppliers to directly control privacy settings in a simple, clear, and intuitive interface. Furthermore, we proactively guard supplier price privacy by strictly enforcing a 10 day waiting period for all new clients, beginning with a new client announcement to all participating suppliers which gives all ample time to modify their privacy settings. Going further, during that 10 day period GRIP applies geographic privacy restrictions between any client and supplier based in the same country (presuming they compete against each other), saving time for those suppliers or in case they didn’t see/act on the announcement for any reason. To be fair, we face a less complex privacy challenge than Facebook, but nonetheless our realization was to place the highest emphasis on creating a trustworthy environment in PricePoint, realizing that pricing is a particularly sensitive area in which users would not want their “worlds to collide”. Hello, I’m Ryan Keintz, co-Founder of GRIP Inc., creator of PricePoint. It’s fair to say I’m also a contrarian. However, I would like to believe I am not the breed of contrarian that I’ve encountered elsewhere – one who rebels for the sake of rebellion, who simply aims to cast an image of being different, or is a naysayer merely for lack of genuine opinion. In fact, in my early school years I was a very obedient Catholic school boy, usually the least likely among my peers to break the rules. But over time I gradually came to realize that some authority figures often didn’t really know what they were talking about, or at least were more confident in their beliefs than I could see justification for. This developed within me a healthy questioning of authority and conventional thinking. Our company GRIP springs from that fundamental willingness to question the traditional way of looking at things. With the innovation of PricePoint, we aim to be a progressive force in the international relocation industry. It’s the type of platform that may be described as disruptive, which naturally inspires both supporters and detractors. This blog will serve as a forum for perspectives on the international relocation industry. Some posts will highlight and question conventional thinking and assumptions which have caught my attention. I will also share various insights regarding our design intentions with PricePoint, as well as some usage recommendations.